MEET LADY DEATH CREATOR BRIAN PULIDO AT EMERALD CITY COMICON! Now’s your chance to shake hands with the creative force known as Brian Pulido at the premier comic book and pop culture convention of the Northwest, Emerald City Comicon! Bring your camera and tag us with your photos of #BrianPulido! The show takes place March 2-5, 2017 at the Washington State Convention Center in Seattle, WA. 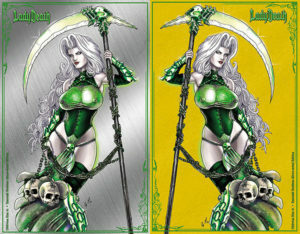 Feast your eyes on these brand new Lady Death exclusives we’re bringing to ECCC! For those of you who won’t be able to attend, we’ll also be offering them for pre-order exclusively at Lady Death Store starting Thursday, March 2 at 9:00AM MST (Arizona Time). PLEASE BE ADVISED: ECCC is one of the largest shows we attend every year and historically, exclusives have sold out very quickly! First come, first served. Full color, 24 pages. Holo-Chrome cover, suitable for grading! Limited to just 50 serially numbered copies! Full color, 24 pages. METAL front cover! Limited to 33 serially numbered copies! Full color, 48 pages. METAL front cover enhanced with real Swarovski crystals! Production run alternates between silver (odd-numbered) and gold (even-numbered) copies for a combined total of just 10 serially numbered copies! SHIPPING ADVISORY: Emerald City Comicon 2017 exclusives preordered at Lady Death Store will ship beginning Wednesday, March 8.